Ting’s main research interest is to study the stellar substructure in our own Milky Way — dwarf galaxies and stellar streams. These features in the Milky Way can help us understand the nature of dark matter. 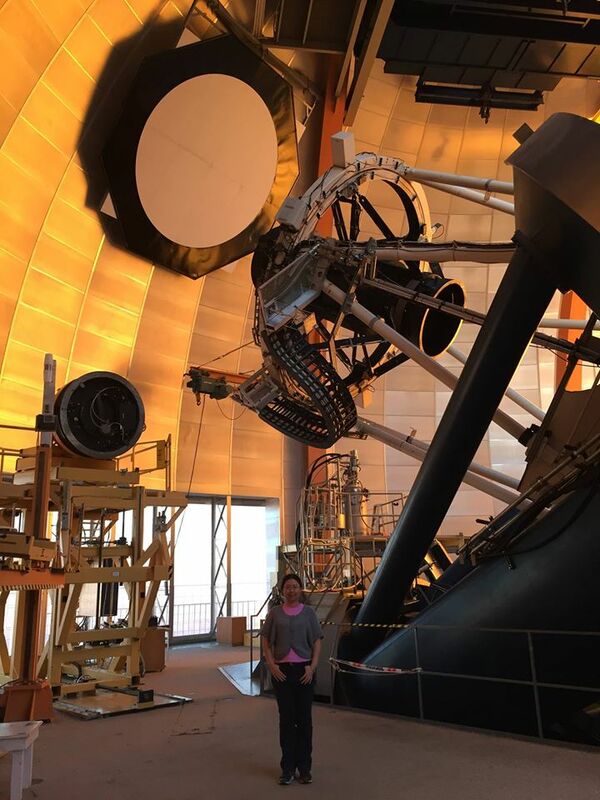 She helps the team discover these stellar associations using DES data, and also follows them spectroscopically using the world’s largest optical telescopes, including Magellan Telescopes, the Vary Large Telescope, etc. Apart from the scientific research, Ting also works on the DES infrastructures. Specifically, she works on the atmospheric transmission monitoring camera and the spectrophotometric calibration system for DECam. These two auxiliary systems will help DES to achieve high precision photometry, which is crucial for DES scientist to understand the nature of dark energy. Ting-quisition: my graduate peers made this word for me, it means that Ting asks someone questions until that person “dies”. I’m not sure if that’s a talent or not, but I do like to ask questions and I learn a lot from asking. Sky survey with CCDs, starting from SDSS. Astronomy has been significantly changed since the birth of CCDs and sky surveys. The progress is huge and revolutionary in the past 10 years. That’s why I joined DES and I think it will be the next revolution (before LSST starts). Thinking back to when you were an undergrad in physics (if applicable), was there anything you were taught then that is not taught now? I wish I had learned more about python and more about statistics. This is the advice I would give to the students who might be considering going to graduate school and pursuing a career in scientific research. I would say that graduate school is tough, so make sure that’s what you want before you decide to go that route. If you decide to take it, then enjoy it. Graduate school is much more independent, compared to the undergraduate program. Instead of professors telling you what to do in your undergraduate study, you are the one who needs to make the decisions about yourself most of the time. You also have to learn a lot of new things by yourself and solve the problems by yourself. So make sure you pick a field that you like and you are interested in. The difficulties can sometimes be incredibly frustrating. However, part of getting closer to becoming a qualified Ph.D. is dealing with setbacks and experiencing failure. Maybe you don’t feel that you are gaining new knowledge every day, or maybe you feel that you are standing still after many days of hard work. But after several months or even years, you will know that you have already made a huge improvement in your research ability. You won’t see the changes every day, but be patient and persistent, and you will succeed.